Sticky notes always contain special information, reminders and things-to-do in everyday life. 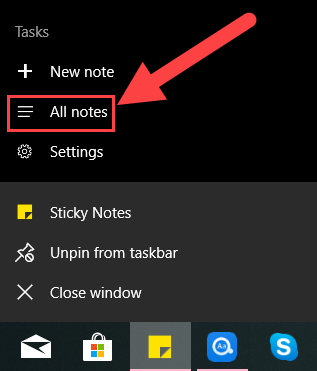 When it comes to Windows 10 computer, Sticky Notes as a built-in app has the same function of keeping the important data that we can access on frequent basis. However, what an important sticky note is missing after closing by mistake? Is there any way to recover closed, missing or deleted sticky notes in Windows 10 computer? In this article, you will find the solutions to recover sticky notes on Windows 10 easily. How Do You Lose Sticky Notes? It is vital to know on which condition the Windows 10 sticky notes are lost in order to take the right solution to get them recovered. Users can click the close buttons on the right corner of every sticky note, or right-click on Sticky Notes app on task bar and choose Close window. For the latter case, sticky notes will return once the app is re-opened. However, for the first case, some people find the close gone even after re-open the app. Don’t worry. The first two methods on this tutorial will fix Windows 10 sticky notes missing problem. If you edit or delete all text on a sticky note, then it is hard, if not impossible, to recover it. This is the real action that you delete a sticky note from computer system. In this case, Method 3 may be able to help. Even if it doesn’t work, you’ll learn a method to avoid deleting sticky notes by mistake. When you accidentally delete a sticky note, the app data is still there. Therefore, we can restore deleted sticky notes from a StickyNotes.snt file. It should be noted that this method doesn’t work for everyone. It is actually suggested try Method 2 first, which is easier and should work for most Windows 10 users. Step 1. Open File Explorer on Windows, navigate to C:\Users\<UserName>\AppData\Roaming\Microsoft\Sticky Notes. Step 3. Select Restore Previous Versions. Note: This will restore Sticky Notes to the latest restore point, so it will overwrite the current data. If you do not want to overwrite the current notes, you can also choose to open the snt file with MS Word, and search for the notes you need. It is a time-consuming process. If you cannot find Sticky Notes directory or the snt file, please keep reading the following methods. 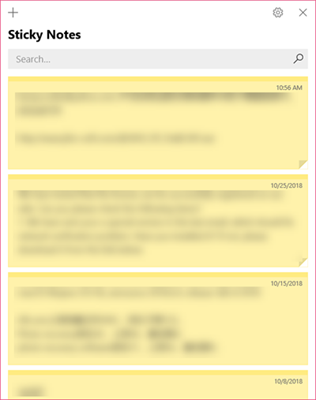 This is nothing but a hidden feature of Windows 10 Sticky Notes. When you close a sticky note, it is actually not deleted but hidden. This method will just tell how to show it again. Step 1. Open Sticky Notes app. Step 2. Right click on Sticky Notes app on Task bar, then choose All notes. Step 3. A full list of notes will appear, including the one that you closed. Step 4. Double click the note that you want to recover, then it will display as a standalone note like all regular ones. As we have said, the data of Sticky Notes is saved in the StickyNotes.snt file. 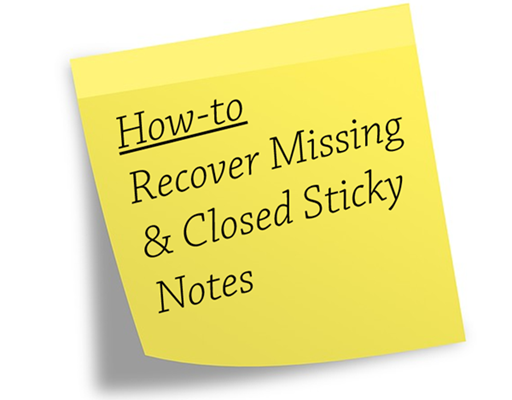 The last method you can try to recover deleted Sticky Notes is using a data recovery software. iReparo for PC is one of the best professional data recovery software for Windows 10 users. It is able to recover all kinds of files from computer, USB drive, SD card, and more storage devices. You can try this program to recover the snt file. Step 1. Run the recovery tool, then choose Recover File. Step 2. Select the partition that contained the sticky notes file, then click Scan Now button. Step 3. When the scanning is finished, find and Recover snt file from the Other category. Once the snt file is recovered, you can open it with a text editor app and search for lost sticky notes. Moreover, the data recovery software is also able to recover Word document, photos, videos, and more other important files. Why Confirm before Deleting Not Working? 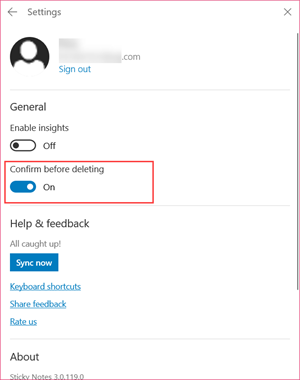 Confirm before deleting is a feature within Sticky Notes, which works for preventing users from deleting notes by accident. Step 1. Right click on Sticky Notes on Task bar, then choose Settings. Step 2. Click the button under Confirm before deleting to turn it on. Step 3. Now when you click three-dot menu > Delete note on the sticky note, a window will pop up asking for confirm. Sticky Notes is a dedicated desktop application in Windows and almost 8 million active users use sticky notes on monthly basis. It plays a vital role in gathering important information and notes while working on documents or browsing. Do not let your important stuff go waste with little learning effort. Fix Windows 10 sticky notes missing issue now and share your experience with us.